One of the more politically-charged headlines to flash across the newswires in recent days is the revelation that Obamacare insurance premiums are going to rise very significantly for next year. While there has been what appears to be a damage-limitation response, presumably from within the administration, to assure consumers that the vast majority of Obamacare subscribers will have the price rises absorbed by government subsidies, the underlying message remains an unfavourable one. Macro Man has no wish to recreate the debates on the "woulds and shoulds" of health care provision that dominated the comments section in 2009 with all the cheery goodwill of your average Brexit argument. Rather, his interest in the subject is an academic one on the potential impact upon market-moving macro variables. It should be noted from the get-go that the macroeconomic data on health care is so contorted that it quite literally strains credulity. According to core inflation weightings, health care is either 25% of expenditure, or 10%. Put another way, it is either 25% more heavily weighted than shelter....or less than 25% of the weighting of shelter. ...whereas the alternative measure has noted broad-based increases across both medical services and commodities recently. 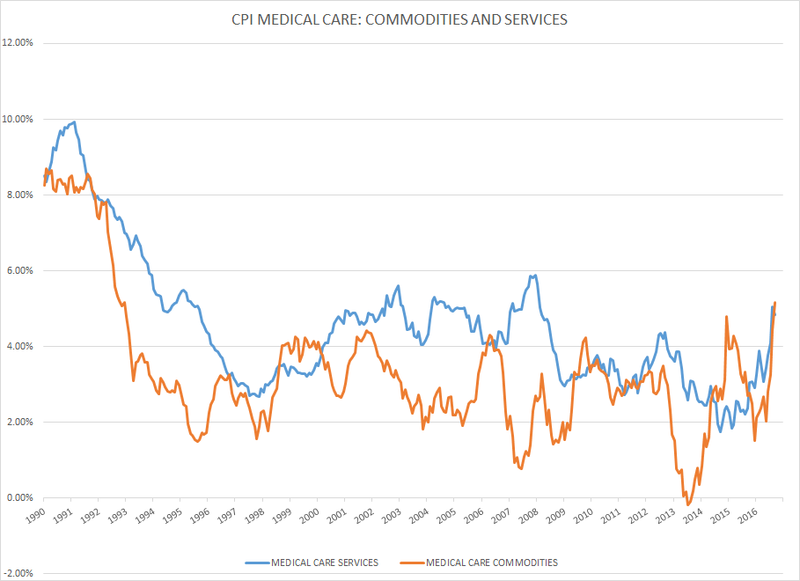 Indeed, the medical commodities component of the CPI is showing its highest inflation rate since 1992. Beyond that, what are we to make of the government statistics on the actual consumption of health care? Looked at it nominal terms, the growth rate has shown a secular decline over the last 25 years, just what you'd expect from an aging population....or B). 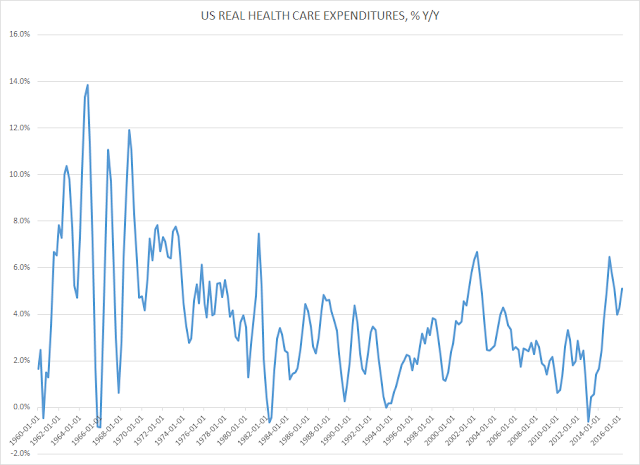 Looking at health care consumption in real terms paints a different picture, with real growth in a noisy trend around 2% per annum. 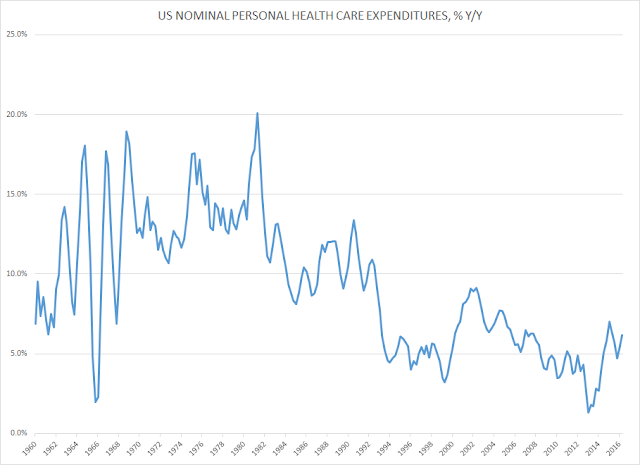 Quite why the data showed y/y growth declining at the beginning of 2013 for the first time in three decades quite eludes your author, though the subsequent spike coinciding with the introduction of Obamacare is probably easier to explain. Anyhow, what are we to make of the Obamacare price rises? 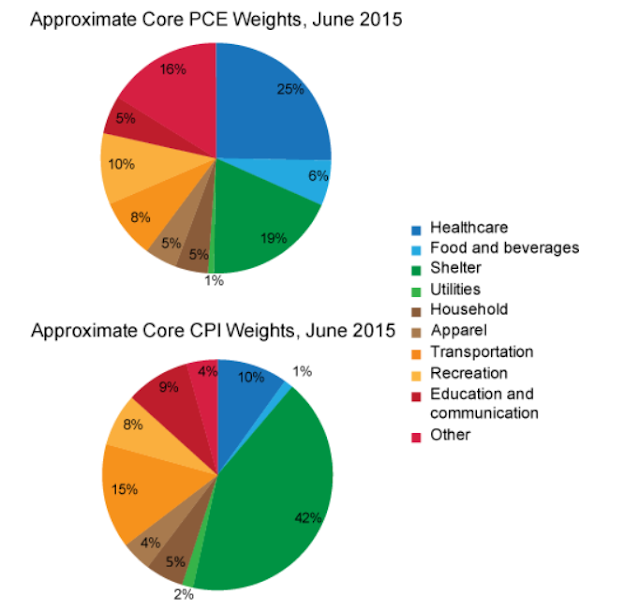 Will they have a macroeconomic impact on inflation? The answer appears to be "probably not", at least directly. 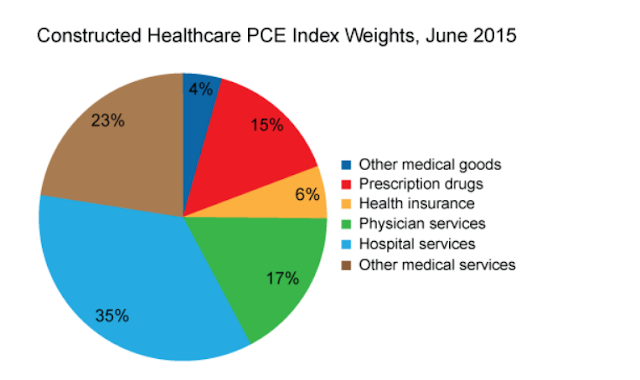 After all, health insurance represents only 0.7% of the CPI index, and even amongst the healthcare component of the PCE index, health insurance is only 6% of the total. However, even if health costs to re-accelerate towards their historical norms, there is little to say that the Fed will react much if at all. In fairness, there is little to suggest that monetary policy is the correct tool to address medical care inflation, particularly in a system as tortuous as that of the United States. 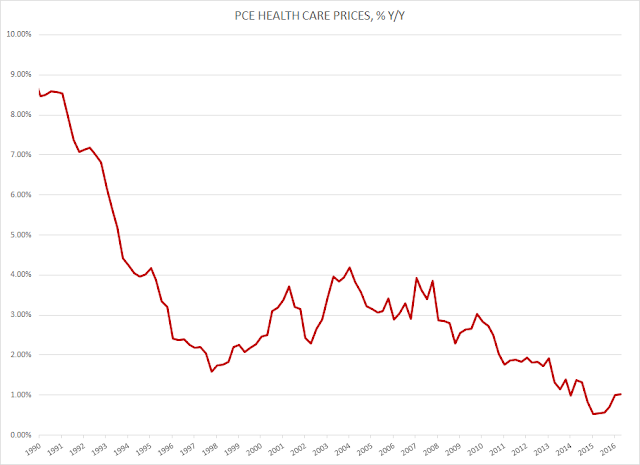 Can't you just imagine Yellen pooh-poohing a medically-induced rise towards 2% in the core PCE inflation rate as being not policy relevant? You want to induce inflation just scrap your lowest denominator coins. Done ! Not saying it will sustain much inflation ,but it certainly will create it. Wash and repeat and all of your yesterday liabilities will be miraculously easier to service as long as you don't go creating new debt even faster than you depreciate the old. Obviously the holders of your that debt are going to be mightily pissed and issuing new debt is going to be a stretch ,but hey ho at the end of the day policy is mainly just redistributive not additive and theirin lies the problem of why we are where we are. 53,000 full time jobs lost and inflation surprising on the upside in Aus today. Certainly not a trend but the market wants to look at the rate of change and stop extrapolating the trend. October 26, 2016 at 9:41 AM × This comment has been removed by the author. You've brought me out of retirement. I've never got anything 100% right over the course of a week...but this guy done the impossible. It took him 8 years but, but he managed to nail one thing superbly. He buttered his bread for the future drivel circuit with lashings of toppings. America are stuck in one big joke. They watch this presidential campaign and judge on personality, well I'm betting the majority do. When are they going to wake up to the fact that every president is surrounded by automatic stabilisers , and this party will just keep getting worse and worse because there will be no change of guard in the "automatic stabilisers". No America , the jokes on you! I'm back on the USD/CAN$ trade. It's breakout until it isn't. In re health costs re-accelerating, at high %GDP that is less and less likely. Health is over 17% GDP, leaving little room for 10% YoY nominal increases. I mean, it's certainly possible, but a decade of that with nominal overall GDP running at 5% put health costs over 30% GDP. Right, what was that about deflation again?! Nice bounce in EURUSD today, but the real clincher is in the bond market. US 10y, bund yields, and gilt 10y all flirting with a break-out higher here. All eyes on that lads. Churn is the name of the game in equities it seems ... max frustration for everyone trying to catch a break higher or lower, but vol sellers rejoice. Still, LB's vol-selling juniors (Chad and his mates) should not count their chickens just yet. They're almost through to the X-mas bonus, but I fear they won't make it! Nothing much to get excited about. Oh, and just for the record MM, great post yesterday on credit. That's where we all have to keep our eyes peeled! It's where the cracks will show. "ease QE rules" Of course! "ease QE rules" Of course!" In a word ....Bundesbank , flush. Hmmmm....if the 12 year olds here are getting any kind of allowance, why not put the money in a the close?